Donald Johanson: Was Lucy a Hoax? Did Donald Johanson perpetrate a hoax upon us when he discovered Lucy? This question is of personal importance to me. It's the slander that was passed on to me and many others by Dr. Robert Gentry on television in 1995. But hold on, the story gets better. Dr. Johanson gave a lecture at the University of Missouri in Kansas City, Nov. 20, 1986, on Lucy and why he thinks she is our ancestor. It included the ideas already mentioned and that Lucyís femur and pelvis were more robust than most chimps and therefore, "could have" walked upright. After the lecture he opened the meeting for questions. The audience of approximately 800 was quiet so some creationists asked questions. Roy Holt asked; "How far away from Lucy did you find the knee?" (The knee bones were actually discovered about a year earlier than the rest of Lucy). Dr. Johanson answered (reluctantly) about 200 feet lower (!) and two to three kilometers away (about 1.5 miles!). Continuing, Holt asked, ìThen why are you sure it belonged to Lucy?î Dr. Johanson: "Anatomical similarity." (Bears and dogs have anatomical similarities). Is this true? Did Donald Johanson find a knee far from Lucy's body, then deceive scientists and the masses alike into believing that it belonged to the same skeleton? Did he then only admit it when confronted by creationists in 1986, almost 12 years to the day after Lucy's discovery? If you know anything about creationist charges against scientists, you will not be surprised to find out that the answer to those questions is no. In 1981, five years before the questions from creationists, Donald Johanson published a book with Maitland Edey called Lucy: The Beginnings of Humankind, giving the details of the discovery of Lucy, and the A. afarensis knee joint found over a mile from Lucy's body. Worse, the knee, found in 1973 before Lucy was even found, has been insignificant since 1975, when the "first family" was found. The "first family" is a collection of parts from 13 Australopithecus afarensis individuals, and it includes at least one knee joint. This was all known long before the 1986 accusations against Dr. Johanson, and it was certainly known long before the above-quoted Forerunner article, which is dated 2007. 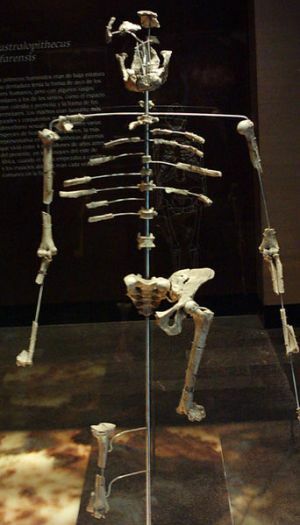 Australopithecus afarensis is one of the most attested species in the fossil record. Hundreds of fossils have been found. Evidence of its bipedality is extensive, including its pelvis, the position of its sacrum, the angle from the femur to the knee, the connections for knee extensors on its leg bones, and the location of its big toe. Donald Johanson neither needed to lie about the knee joint he discovered in 1973, nor is there any evidence that he ever did lie about it. In fact, he published a book in 1981 describing everything that the anti-evolutionists claimed to have discovered by questioning in 1986.